- Decorated in shades of sea foam and coral, this two bedroom villa is in easy walking distance of Mallory Square, Duval Street and the finest beach in the lower Keys. - French doors in the living room open to a tropical garden dotted with bougainvillea and hibiscus. It's the perfect place to cool off after a day at the beach or the reef. - The property is located in the fabulous Truman Annex, a gated community with 24-hour security and assigned parking for one car. - The location simply can't be beat! - Please note that we rent from Saturday to Saturday almost exclusively in-season . During Fantasy Fest, powerboat races and off-season, other dates are allowed. - Also, please note that we only rent for periods of a week or longer. I came down to Key west to take a break from the cold during my college years, and bought this property in December 1998. I now live about four blocks away and play music around town. This is the best location in Key West -- bar none. It's also very pretty and green. 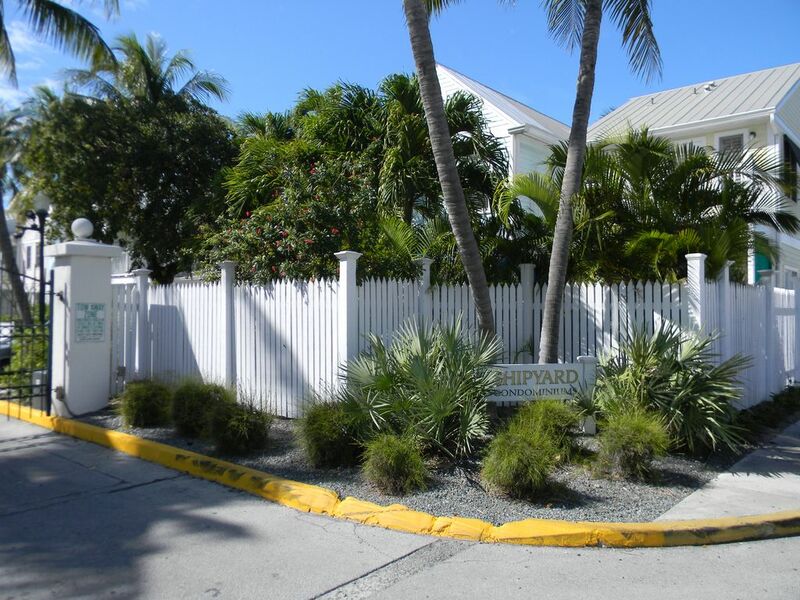 This property has most everything you will need for your stay in Key West. Both bedrooms have queen beds with quality linens. The sofa in the living room also pulls out to a bed. The kitchen is fully equipped with a microwave, dishwasher and all cooking items. The property has two flatscreens, a DVD player and a compact stereo. The Shipyard also has a terrific pool -- great for families! aboard a schooner? Send me an e-mail and I'll put you in touch with friends who will be glad to have you aboard. Please note that this is a weekly rental, only.